• Multi-use on-board Controller with either local POT control and monitoring or via MODBUS RTU network. 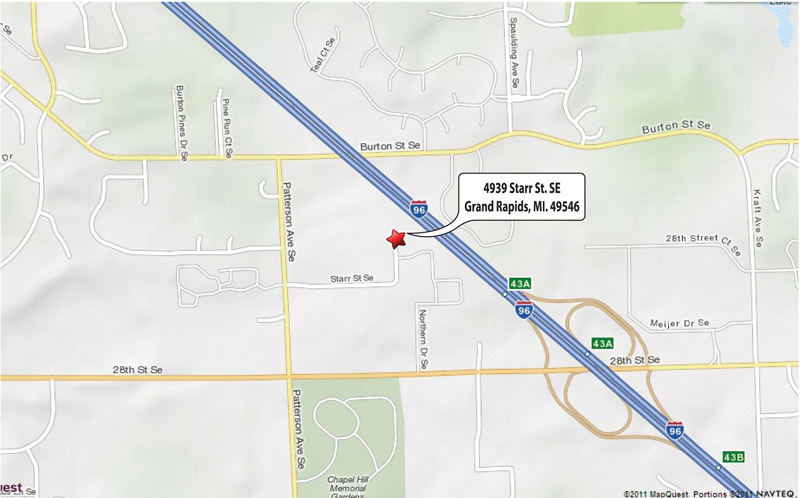 • Factory setup and addressing to match your project specifications. • An electronically commutated motor that is programmed to increase the speed as the load increases to maintain a constant airflow. • Torque programming also available for ducted applications. 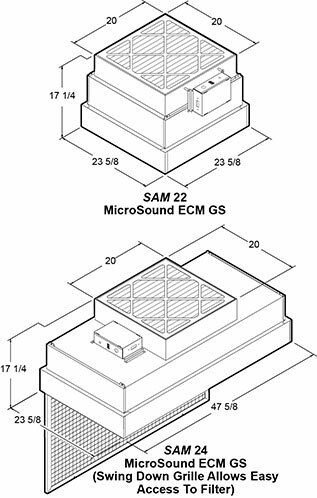 SAM MicroSound ECM GS units feature a roomside removable filter element with a gel channel on the upstream side of the final filter which provides a leak-free seal between the filter and the filter housing. SAM MicroSound ECM NCR units feature a low profile unit with an upstream gasket for a leakfree seal between the final filter and the SAM plenum. Housings are fabricated from steel with a white powdercoat finish. The ECM motor blower is a 1/3 HP, motor with a forward curved blower. 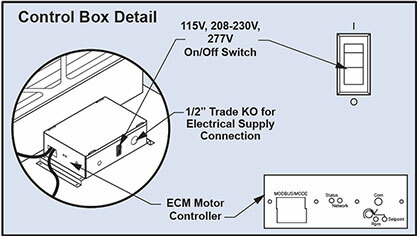 Units are available in 115V (60 Hz), 208-230V (50/60Hz) and 277V (60 Hz). SAM MicroSound Fan Filter Units include a 99.99% efficient HEPA filter, 30% ASHRAE pleated type prefilter, seismic clip suspension points. Final filters are protected with a white epoxy diamond pattern grille and are tested according to accepted procedures as described by the Institute of Environmental Sciences (IEST) and/or ISO standards. The standard HEPA filter is 99.99% eff. and an ULPA grade 99.9995% eff. filter is available as an option. A polystyrene eggcrate grille in an anodized aluminum frame is hinged to open, permitting removal of the filter without removing the unit from the ceiling (GS models only). Optional perforated stainless steel or aluminum grilles are available. Some of the many available options include: roomside motor access and challenge ports, duct collars, ULPA filtration and stainless steel construction. Many control options are available, including MODBUS RTU protocol networking, infrared remote control, roomside digital display, or a complete SAMlink Control System. 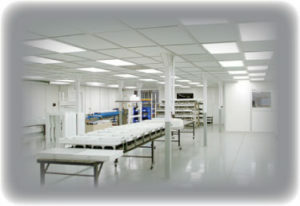 For other control options or further information please consult with your Clean Rooms International Inc. representative or contact the factory. GS-Style Filter Data: The HEPA Filter is designed for 90 FPM average face velocity @ initial 0.47 w.g. and has a rated efficiency of 99.99% @ 0.3 micron or larger. An anodized aluminum frame holds the 53mm media which is protected by a diamond pattern white epoxy coated steel grille. Final filters are replaceable from roomside. NCR-Style Filter Data: The HEPA Filters are designed for 90 FPM average face velocity @ initial 0.47 w.g. and have a rated efficiency of 99.99% @ 0.3 micron or larger. An anodized aluminum frame holds the 53mm media which is protected by a diamond pattern white epoxy coated steel grille. 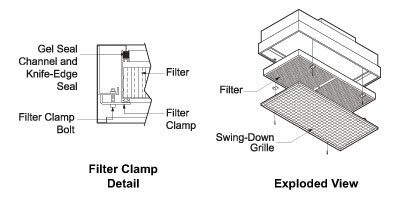 Final filters can be replaced by removing unit from ceiling, placing on a bench, removing and replacing the filter and re-installing unit in ceiling. Access Port (GS Style Only): This port is located in the center of the filter element face and is used for introducing an upstream challenge or measuring static pressure. Air Flow: Designed for 90 FPM +/- 20%. On 2×4 units at 90 FPM, the CFM is 630 for the NCR style and 520 for the GS style. Sound Level: At 90 FPM with a clean unloaded HEPA filter and zero e.s.p. the sound level is 50-53 dBa. See table below. *When using on house HVAC systems, Please consult factory. NOTE: Duct collar adapters #19950 & #19951 may be used without negating the UL listing. All other duct collars, air conditioning boxes, pilot lights, and adding other electrical components negates UL listing.